According to Wikipedia, over the span of his career, Nielsen appeared in over one hundred films and 1,500 television programs, and yet, despite appearing in many famous movies (The “the Forbidden Plane” in 1956 and The Poseidon Adventure in 1972, just to mention a few), he’ll be remembered forever for his “second youth” when he started to show his perfect deadpan comedy skills. First, the supporting role in Airplane! 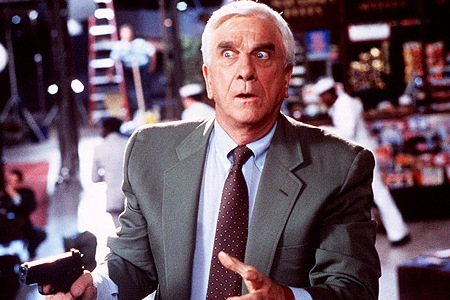 (possibly one of the funniest film I’ve ever seen) and then of course, Lt. Frank Drebin the Naked Gun Series. When it was suggested that his role in Airplane! was against type, Nielsen protested that he had “always been cast against type before,” and that comedy was what he always really wanted to do. And it clearly shows. Leslie Nielsen had the perfect comic timing and his deadpan deliveries in the mist of the most chaotic situations were impeccable. And even if ins his later films he probably became a spoof-making machine and his movies degenerated into complete rubbish, we still love him for that child in him that never grew up and for the stomach aches he’s been giving us throughout the years just out of laughter. EMPIRE MAGAZINE online run a tribute page with his best quotes, but my favourite is not from any movie in particular, but from the man himself “Doing nothing is very hard to do…you never know when you’re finished”. So true. He’ll be missed by all of those who grew up watching him, but his comic genius will remain forever for the future generations.